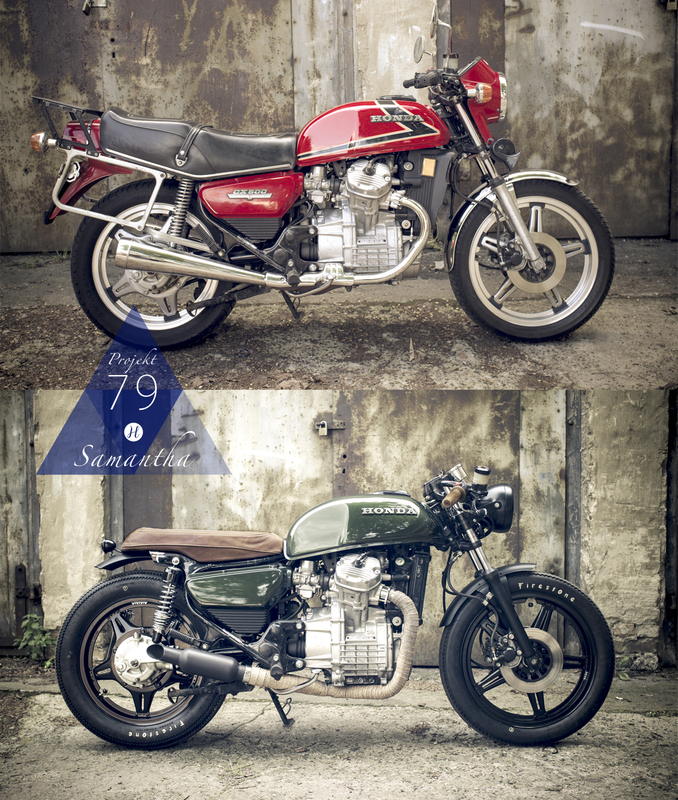 Moto-Mucci: DAILY INSPIRATION: Alexander Herold's 1979 Honda CX500 "Samantha"
DAILY INSPIRATION: Alexander Herold's 1979 Honda CX500 "Samantha"
Every once in a while I get e-mails from people who have been inspired by the CX500 I built to pick up their own. I think most of us have that one influence in our lives that sparked us to get on two wheels so it's always a great feeling to be that influence to someone else. A guy named Alex from Berlin sent me one of those e-mails back in early May. I congratulated him, passed on a few learnings I've had acquired over the years of ownership and wished him good luck with the build. Well I just received another e-mail from Alex exclaiming that he's finished his bike. 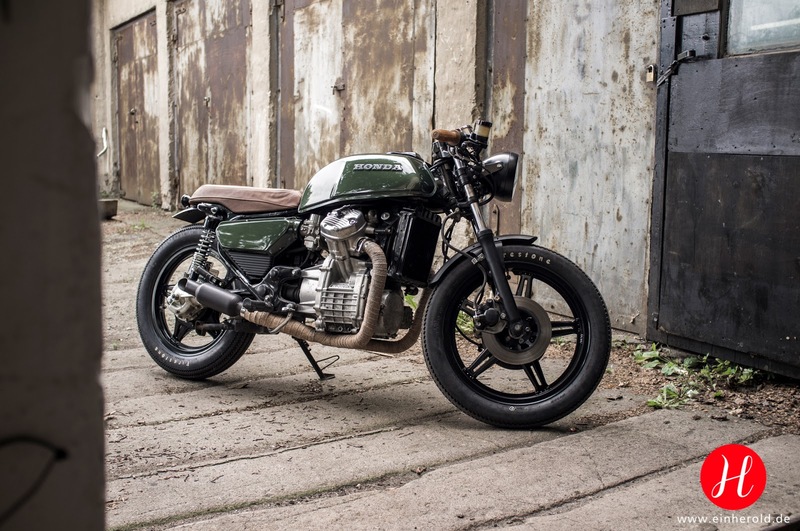 This 1979 CX500 is the first bike he's dabbled with. 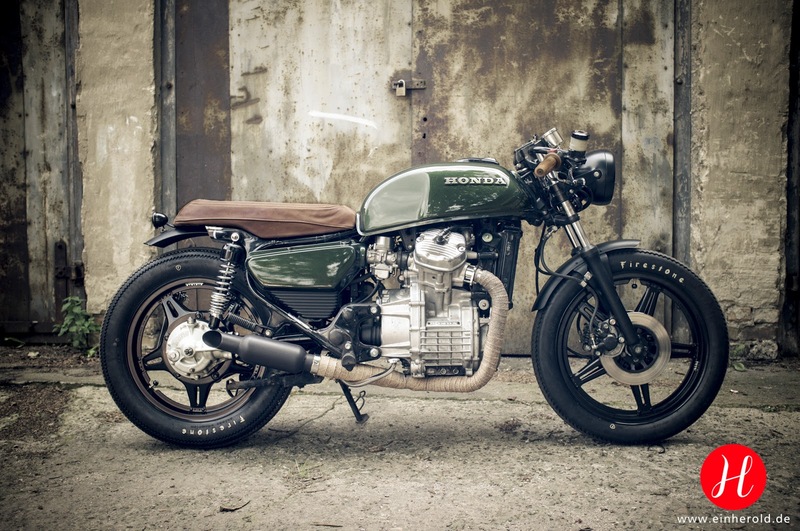 It borrows much of it's visuals from the CX500 I built but what's interesting to me is where it differs. I always try to encourage people to put their own touches into their machines. Imitation is flattering but in the end you'll feel much more accomplished in knowing that the bike is original to you and your vision. Alex's chosen points of differentiation are very well done and his execution is up there with what I've seen from well seasoned wrenchers. Alex is now hooked and already has his eye on the next build, a Moto-Guzzi LeMans III for a friend of his. I'm excited to see where it goes! Read on for a list of Alex's own personal touches. "Because of German laws for vehicles I needed to put blinkers and a speedo on the bike. I've chosen simple mini blinkers and a 60mm retro speedo with all LED control lights. Head and Taillight also needed to be certified. The headlight is a new H4 reflector in an old fully matte black housing and the taillight is a modern 9 LED tail and brake light in classic bates design. My Tires of choice are the Firestone Champion Deluxe. I shaped the fenders to be more in line with the tires. The front fender is the original CX fender. I just removed the round edge and shortened it on both sides to have it in line with the disc brakes and headlight in front and the lower edge of the water cooler in rear. It's a pity that we can't have this open look of the wheel here in Europe." 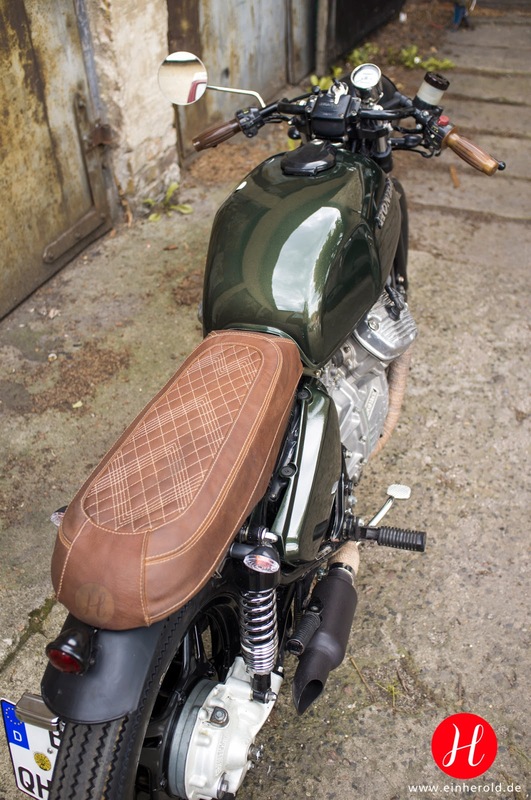 "The rear fender is a universal fender I found online in nearly the same shape like the front one. I decided to make a higher seat and in brown to match the grips. For the stitching I worked together with Berlin fashion designer Karen Jessen from Benu Berlin who then made the leatherwork. I found a local shop who can laser all materials and they lasered my logo into the rear leather piece of the seat. For the stitching we've chosen sewing cotton in the same color like the exhaust wrap. I made a much shorter and a little curved and open ending for the exhaust out of an old exhaust pipe from my car. The fuel cap and fuse box I kept in black. My color of choice is a 1977 Porsche paint called Oak Green Metallic. I think to keep the side panels is important for the line of the bike so I kept them but decided to paint the lower parts in matte black to make them visually smaller. The green is so bright and it was just to much in full green. I've done nothing to the frame to keep the used and naturally aged look of it in contrast to the highly polished new metallic paint. Another regulation in germany is about the size of the numberplate. It must be lightened so I made a bracket on the left side of the rear wheel. We need to have a rear view mirror on the left side so I kept the standard CX mirror." Very well done. Love the tires and great idea with painting the side covers partially black. 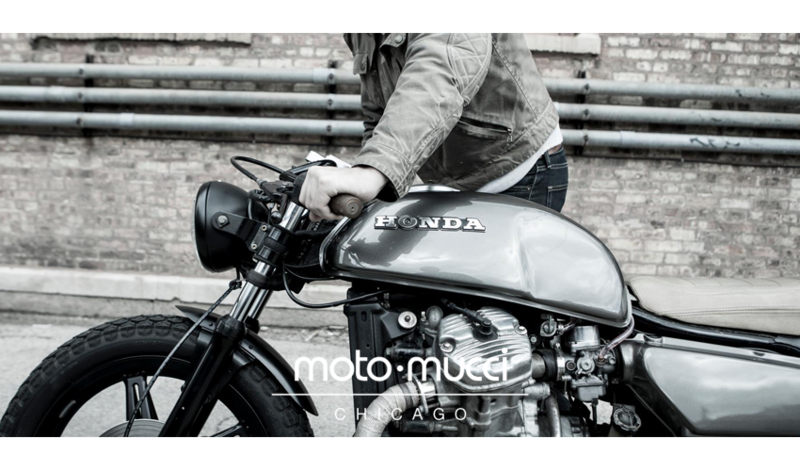 I do agree with David in how satisfying it is to build its own vision, though in my opinion, "mucci's" are among the most style satisfying bikes i've seen. Very nice! Congrats on a very well executed and clean build. Very nice to see and read how many people are so enthusiastic about de original by mr. Mucci. Trust me, I am one of those. This Samantha is also a jewel. Congrats with it! The result is outstanding and it's nice to see something different (shaft drive, v-twin). I feel bad for the original bike though. It looks like it was in great shape too bad it had to be chopped off.